The Newly Retired Webinar provides basic information for Wisconsin Retirement System members who have recently entered or are soon to enter retirement status. Topics include initial (“estimated”) retirement annuity payments, “finalized” payments and adjustments, post-retirement life and health insurance, and return to work rules under the WRS. Tue, Mar 5, 2019 11:00 a.m. – 11:30 a.m.
Thu, Mar 14, 2019 11:30 a.m. – 12:00 p.m.
Thu, Mar 21, 2019 12:30 p.m. – 1:00 p.m. Wed, Mar 27, 2019 6:00 p.m. – 6:30 p.m. This webinar will help to increase your understanding of the WRS annuity options available to you at retirement. We will also explain the difference between a beneficiary and a named survivor. Mon, Mar 4, 2019 6:00 p.m. – 6:30 p.m.
Fri, Mar 8, 2019 12:30 p.m. – 1:00 p.m. Wed, Mar 13, 2019 11:30 a.m. – 12:00 p.m.
Thu, Mar 21, 2019 11:00 a.m. – 11:30 a.m. This webinar will explain the methods used for benefit calculations and the components of each method. Anyone who has requested or is planning to request an estimate will have a better understanding of how that amount was calculated. Fri, Mar 1, 2019 11:30 a.m. – 12:00 p.m.
Tue, Mar 5, 2019 12:30 p.m. – 1:00 p.m.
Tue, Mar 12, 2019 6:00 p.m. – 6:30 p.m.
Thu, Mar 28, 2019 12:00 p.m. – 12:30 p.m.
Fri, Mar 8, 2019 10:00 a.m. – 11:00 a.m. Wed, Mar 13, 2019 6:00 p.m. – 7:00 p.m.
Thu, Mar 14, 2019 1:00 p.m. – 2:00 p.m. Wed, Mar 20, 2019 11:00 a.m. – 12:00 p.m. Wed, Mar 6, 2019 12:00 p.m. – 12:30 p.m.
Mon, Mar 11, 2019 11:00 a.m. – 11:30 a.m.
Thu, Mar 21, 2019 6:00 p.m. – 6:30 p.m.
Tue, Mar 26, 2019 12:30 p.m. – 1:00 p.m.
Mon, Apr 1, 2019 6:00 p.m. – 6:30 p.m.
Fri, Apr 5, 2019 11:00 a.m. – 11:30 a.m.
Tue, Apr 9, 2019 11:30 a.m. – 12:00 p.m.
Tue, Apr 23, 2019 12:00 p.m. – 12:30 p.m.
TIAA INDIVIDUAL COUNSELING SESSIONS – Wednesday, March 6th at 11 am to 4:30 pm in the University Union Heritage Room. 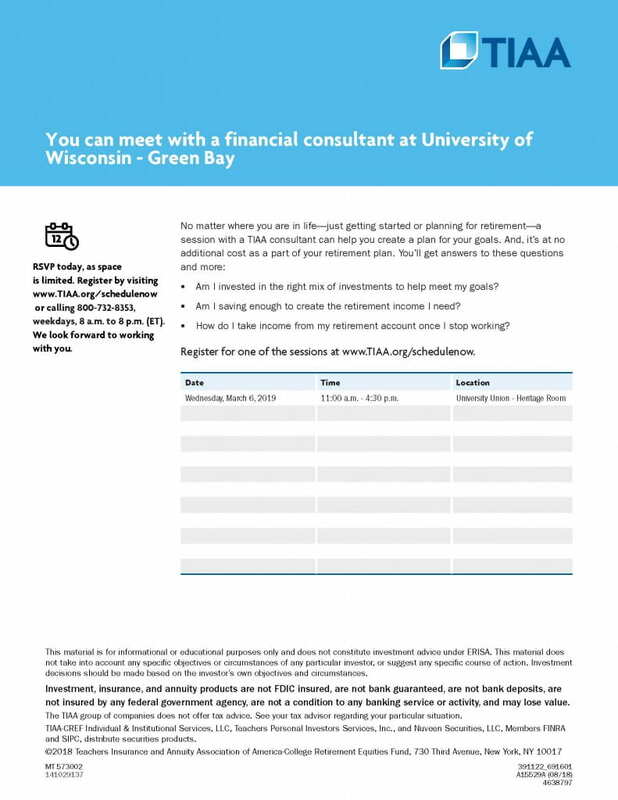 TIAA is offering individual and confidential counseling sessions where you can discuss your financial situation with a TIAA consultant. To schedule a consultation with representative Chad Stein, please register at www.TIAA.org/schedulenow or call 1-800-732-8353. Have you ever wished you could seek basic medical care from the comfort of your own home? If so, the telemedicine/telehealth (used interchangeably) services added to the State Group Health Insurance Program effective January 1, 2019 may allow you to do so. The remote diagnosis and treatment of patients by means of electronic communication. This means that for non-emergent medical care, you may be able to access care through video chat or a virtual house call. Through telemedicine, a doctor may be able to recommend treatment, prescribe medication, refer you to a specialist or tell you, based on your symptoms, if you should see a doctor in-person. Note: These services vary among the carriers in the State Group Health Insurance Program. Why should you consider telemedicine services? With telemedicine services, you may receive care quicker and it may be more convenient than going to your doctor’s office or to urgent care. They are also typically less expensive than an office visit or urgent care visit. How will your telemedicine/telehealth service be covered by your State Group Health Insurance? How the service is covered will depend on which plan design you are enrolled in. Health Plan: If you are enrolled in this plan, telemedicine services are covered at 100%. High Deductible Health Plan (HDHP): If you are enrolled in the HDHP, you will need to meet your deductible first, then these services will be covered at 100%. This is necessary in order to comply with Health Savings Account (HSA) eligibility requirements as well as the coverage mandates under the Affordable Care Act (ACA). How can you obtain additional information regarding telemedicine services? Generally, health plans offer telemedicine services through their online portals. If you’re unable to find telemedicine information through your health insurance plans online portal, contact your health insurance plan directly by calling the toll-free number on your health plan ID card. Employees enrolled in the Health Care, Limited Purpose and/or Dependent Day Care Flexible Spending Accounts (FSA) for the 2018 plan year have until March 31, 2019 to submit claims to TASC, the FSA administrator, for reimbursement. Mobile App: Use your mobile device’s camera to submit claims through TASC’s mobile app. TASC Online Account: Login to your TASC account to submit claims online. FSA Reimbursement Claim Form: Download a claim form and submit to TASC via fax or mail. For efficient processing, remember to include the appropriate IRS required supporting documentation with your claim(s) submission. Carryover Reminder: Up to $500 of unused funds in a 2018 Health Care FSA may carry over into a 2019 Health Care or Limited Purpose FSA account (even if you did not enroll in the FSA during the 2019 Annual Benefits Enrollment period). Unused funds greater than $500 on March 31, 2019 will be forfeited. There is no carryover provision for the Dependent Day Care FSA. For questions, contact TASC at 1-844-786-3947 or 1customercare@tasconline.com. ETF is offering a series of 30-minute, live, interactive webinars designed to increase your understanding of Wisconsin Retirement System benefits. Individuals can also ask questions at the end of these sessions. 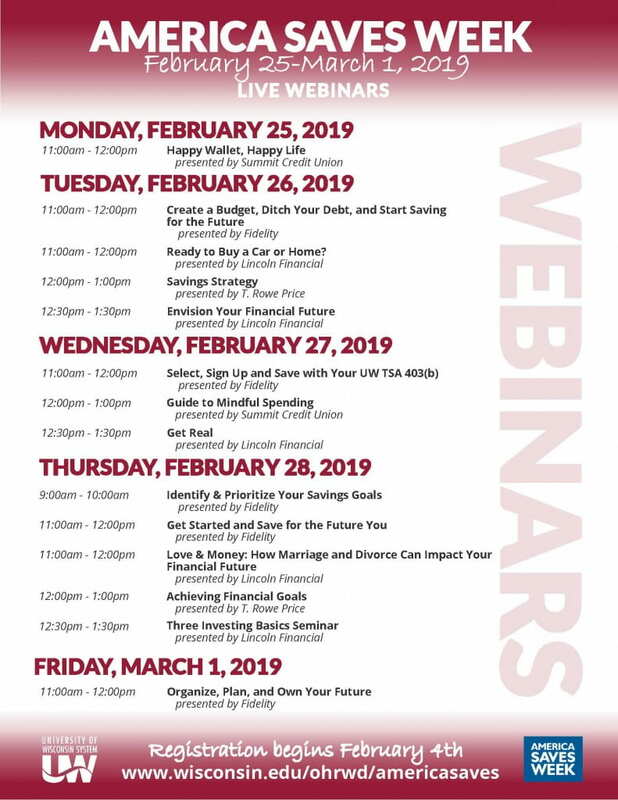 Visit the ETF webinar page to learn more about any of the following sessions. Wed, Feb 6, 2019 6:00 p.m. – 6:30 p.m.
Tue, Feb 12, 2019 11:30 a.m. – 12:00 p.m.
Mon, Feb 18, 2019 12:00 p.m. – 12:30 p.m.
Thu, Feb 28, 2019 11:00 a.m. – 11:30 a.m. Beneficiary Designations – What Happens to My Account When I Die? Do you have a beneficiary designation on file with ETF and does it reflect how you would want your WRS death benefits paid? This webinar reviews the importance of having a beneficiary designation on file and keeping it updated as life events occur. We will also review how to correctly complete a designation form, what it means if you do not have one on file with ETF, and how to request a copy of your current form. Mon, Feb 4, 2019 11:30 a.m. – 12:00 p.m.
Thu, Feb 14, 2019 12:00 p.m. – 12:30 p.m.
Mon, Feb 18, 2019 6:00 p.m. – 6:30 p.m.
Thu, Feb 28, 2019 12:30 p.m. – 1:00 p.m. This webinar will cover participation in the Wisconsin Retirement System, how the WRS is funded and what benefits are available under the WRS. A brief overview of the Core and Variable Trust Funds and how the WRS is structured are included. Thu, Feb 7, 2019 11:00 a.m. – 11:30 a.m. Wed, Feb 13, 2019 6:00 p.m. – 6:30 p.m.
Tue, Feb 19, 2019 11:30 a.m. – 12:00 p.m.
Mon, Feb 25, 2019 12:00 p.m. – 12:30 p.m.
Tue, Feb 5, 2019 11:30 a.m. – 12:00 p.m. Wed, Feb 13, 2019 12:00 p.m. – 12:30 p.m.
Thu, Feb 21, 2019 12:30 p.m. – 1:00 p.m.
Tue, Feb 26, 2019 6:00 p.m. – 6:30 p.m.
Employees and spouses currently enrolled in the State Group Health Insurance Program are eligible for an annual $150 wellness incentive (administered by StayWell). 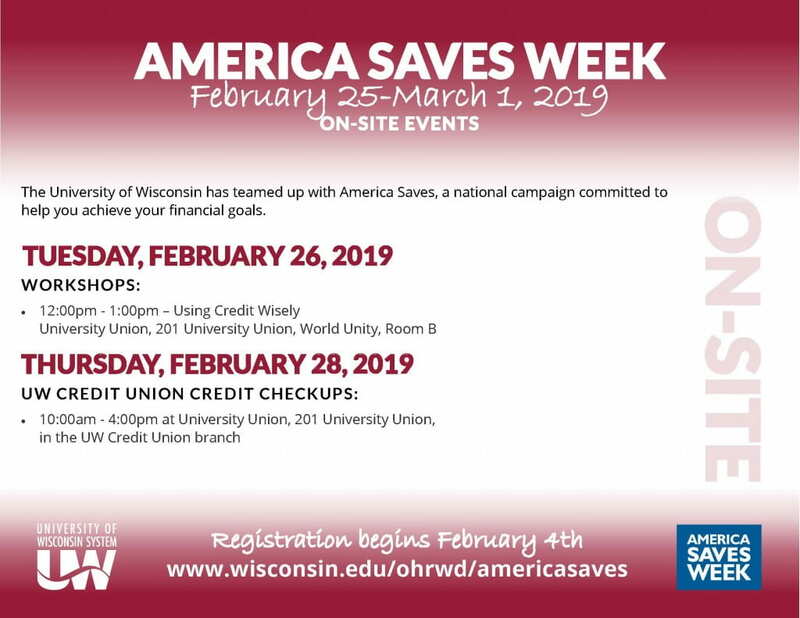 A Well Wisconsin webinar highlighting features of the 2019 program will be offered on Wednesday, February 13 from 12-12:30 pm. To register, visit wellwisconsin.staywell.com. Submit 2019 health screening results. Take the StayWell health assessment. Complete a StayWell well-being activity. Sleep Well is a challenge to support participants with improving their overall sleep. It requires completing an eight-week challenge and post-assessment. Short digital workshops which include an article, short video and quiz. Completing one workshop counts as a well-being activity. For more information about the Well Wisconsin program, scheduling a health screening, taking the health assessment, well-being activities and the StayWell mobile app, visit wellwisconsin.staywell.com, or contact the StayWell HelpLine at 800-821-6591. Throughout 2019, StayWell will send emails and home mailers to employees with information about the program. Income Continuation Insurance (ICI) premiums are updated annually on February 1. Updated premiums for University Staff (paid bi-weekly) will be reflected on the February 14, 2019 paycheck. Updated ICI premiums for Faculty/Academic Staff/Limited Appointees (paid monthly) will be reflected on the March 1, 2019 paycheck. If you are currently enrolled in the ICI program, visit the ICI Premium Notice web page for your personalized updated premium amount. Current enrollees were sent an email January 18 directing them to this customized web page. For University Staff: the ICI premium is based on 2018 earnings reported to the Wisconsin Retirement System (WRS), sick leave balance/usage as of December 22, 2018 and current ICI category. For Faculty/Academic Staff/Limited Appointees: the ICI premium is based on 2018 WRS-reported earnings and the selected ICI elimination period. Please note: The ICI annual premium update effective February 1 is based on 2018 earnings and does not reflect any enrollments made during the ICI Deferred Enrollment period which began in January and ends March 1, 2019. Employees who are eligible to participate in the ICI Deferred Enrollment period received notification about their opportunity via an email sent January 19. A complete list of ICI premiums and plan information is available on the ICI plan page. If you have questions, contact Payroll & Benefits at (920) 465-2390 or payrollandbenefits@uwgb.edu.